Adam: What is emotional valence (as opposed to valence in chemistry)? Mike: Put simply, emotional valence is how pleasant or unpleasant something is. A somewhat weird fact about our universe is that some conscious experiences do seem to feel better than others. Adam: What makes things feel the way they do? What makes some things feel better than others? Mike: This sounds like it should be a simple question, but neuroscience just don’t know. It knows a lot of random facts about what kinds of experiences, and what kinds of brain activation patterns, feel good, and which feel bad, but it doesn’t have anything close to a general theory here. ..the way affective neuroscience talks about this puzzle sometimes sort of covers this mystery up, without solving it. And the way affective neuroscience talks about this puzzle sometimes sort of covers this mystery up, without solving it. For instance, we know that certain regions of the brain, like the nucleus accumbens and ventral pallidum, seem to be important for pleasure, so we call them “pleasure centers”. But we don’t know what makes something a pleasure center. We don’t even know how common painkillers like acetaminophen (paracetamol) work! Which is kind of surprising. In contrast, the hypothesis about valence I put forth in Principia Qualia would explain pleasure centers and acetaminophen and many other things in a unified, simple way. Adam: How does the hypothesis about valence work? (2) It could finally explain how the brain’s so-called “pleasure centers” work– they function to tune the brain toward more symmetrical states! (3) It implies lots and lots of weird, bold, *testable* hypotheses. For instance, we know that painkillers like acetaminophen, and anti-depressants like SSRIs, actually blunt both negative *and* positive affect, but we’ve never figured out how. Perhaps they do so by introducing a certain type of stochastic noise into acute & long-term activity patterns, respectively, which disrupts both symmetry (pleasure) and anti-symmetry (pain). Adam: What kinds of tests would validate or dis-confirm your hypothesis? How could it be falsified and/or justified by weight of induction? Direct, low-power stimulation (TMS) in harmonious patterns (e.g. 2hz+4hz+6hz+8hz…160hz) should feel remarkably more pleasant than stimulation with similar-yet-dissonant patterns (2.01hz+3.99hz+6.15hz…). Those are some ‘obvious’ ways to test this. But my hypothesis also implies odd things such as that chronic tinnitus (ringing in the ears) should product affective blunting (lessened ability to feel strong valence). Note: see https://qualiacomputing.com/2017/06/18/quantifying-bliss-talk-summary/ and http://opentheory.net/2018/08/a-future-for-neuroscience/ for a more up-to-date take on this. Adam: Why is valence research important? Mike Johnson: Put simply, valence research is important because valence is important. David Chalmers famously coined “The Hard Problem of Consciousness”, or why we’re conscious at all, and “The Easy Problem of Consciousness”, or how the brain processes information. I think valence research should be called “The Important Problem of Consciousness”. When you’re in a conscious moment, the most important thing to you is how pleasant or unpleasant it feels. That’s the philosophical angle. We can also take the moral perspective, and add up all the human and non-human animal suffering in the world. If we knew what suffering was, we could presumably use this knowledge to more effectively reduce it and make the world a kinder place. We can also take the economic perspective, and add up all the person-years, capacity to contribute, and quality of life lost to Depression and chronic pain. A good theory of valence should allow us to create much better treatments for these things. And probably make some money while doing it. Finally, a question I’ve been wondering for a while now is whether having a good theory of qualia could help with AI safety and existential risk. I think it probably can, by helping us see and avoid certain failure-modes. If we understand how to measure valence, we could use this as part of a “sanity check” for AI behavior. If some proposed action would cause lots of suffering, maybe the AI shouldn’t do it. Understanding consciousness & valence seem important for treating an AI humanely. We don’t want to inadvertently torture AIs- but how would we know? Understanding consciousness & valence seems critically important for “raising the sanity waterline” on metaphysics. Right now, you can ask 10 AGI researchers about what consciousness is, or what has consciousness, or what level of abstraction to define value, and you’ll get at least 10 different answers. This is absolutely a recipe for trouble. But I think this is an avoidable mess if we get serious about understanding this stuff. Adam: Why the information theoretical approach? Mike: The way I would put it, there are two kinds of knowledge about valence: (1) how pain & pleasure work in the human brain, and (2) universal principles which apply to all conscious systems, whether they’re humans, dogs, dinosaurs, aliens, or conscious AIs. It’s counter-intuitive, but I think these more general principles might be a lot easier to figure out than the human-specific stuff. Brains are complicated, but it could be that the laws of the universe, or regularities, which govern consciousness are pretty simple. That’s certainly been the case when we look at physics. For instance, my iPhone’s processor is super-complicated, but it runs on electricity, which itself actually obeys very simple & elegant laws. >Anything piped through the complexity of the brain will look complex, regardless of how simple or complex it starts out as. Similarly, anything will look irreducibly complex if we’re looking at it from the wrong level of abstraction. Adam: What do you think of Thomas A. Bass’s view of ITheory – he thinks that (at least in many cases) it has not been easy to turn data into knowledge. That there is a pathological attraction to information which is making us ‘sick’ – he calls it Information Pathology. If his view offers any useful insights to you concerning avoiding ‘Information Pathology’ – what would they be? Mike: Right, I would agree with Bass that we’re swimming in neuroscience data, but it’s not magically turning into knowledge. There was a recent paper called “Could a neuroscientist understand a microprocessor?” which asked if the standard suite of neuroscience methods could successfully reverse-engineer the 6502 microprocessor used in the Atari 2600 and NES. This should be easier than reverse-engineering a brain, since it’s a lot smaller and simpler, and since they were analyzing it in software they had all the data they could ever ask for, but it turned out that the methods they were using couldn’t cut it. Which really begs the question of whether these methods can make progress on reverse-engineering actual brains. As the paper puts it, neuroscience thinks it’s data-limited, but it’s actually theory-limited. The first takeaway from this is that even in the age of “big data” we still need theories, not just data. We still need people trying to guess Nature’s structure and figuring out what data to even gather. Relatedly, I would say that in our age of “Big Science” relatively few people are willing or able to be sufficiently bold to tackle these big questions. Academic promotions & grants don’t particularly reward risk-taking. Adam: Information Theory frameworks – what is your “Eight Problems” framework and how does it contrast with Giulio Tononi’s Integrated Information Theory (IIT)? How might IIT help address valence in a principled manner? What is lacking IIT – and how does your ‘Eight Problems’ framework address this? Mike: IIT is great, but it’s incomplete. I think of it as *half* a theory of consciousness. My “Eight Problems for a new science of consciousness” framework describes what a “full stack” approach would look like, what IIT will have to do in order to become a full theory. The biggest two problems IIT faces is that (1) it’s not compatible with physics, so we can’t actually apply it to any real physical systems, and (2) it says almost nothing about what its output means. Both of these are big problems! But IIT is also the best and only game in town in terms of quantitative theories of consciousness. Principia Qualia aims to help fix IIT, and also to build a bridge between IIT and valence research. If IIT is right, and we can quantify conscious experiences, then how pleasant or unpleasant this experience is should be encoded into its corresponding mathematical object. Adam: What are the three principles for a mathematical derivation of valence? Mike: First, a few words about the larger context. Probably the most important question in consciousness research is whether consciousness is real, like an electromagnetic field is real, or an inherently complex, irreducible linguistic artifact, like “justice” or “life”. If consciousness is real, then there’s interesting stuff to discover about it, like there was interesting stuff to discover about quantum mechanics and gravity. But if consciousness isn’t real, then any attempt to ‘discover’ knowledge about it will fail, just like attempts to draw a crisp definition for ‘life’ (elan vital) failed. If consciousness is real, then there’s a hidden cache of predictive knowledge waiting to be discovered. If consciousness isn’t real, then the harder we try to find patterns, the more elusive they’ll be- basically, we’ll just be talking in circles. David Chalmers refers to a similar distinction with his “Type-A vs Type-B Materialism”. I’m a strong believer in consciousness realism, as are my research collaborators. The cool thing here is, if we assume that consciousness is real, a lot of things follow from this– like my “Eight Problems” framework. Throw in a couple more fairly modest assumptions, and we can start building a real science of qualia. Basically, they combine to say: this thing we call ‘valence’ could have a relatively simple mathematical representation. Figuring out valence might not take an AGI several million years. Instead, it could be almost embarrassingly easy. Adam: Does Qualia Structuralism, Valence Structuralism and Valence Realism relate to the philosophy of physics principles of realism and structuralism? If so, is there an equivalent ontic Qualia Structuralism and Valence Structuralism?…. Mike: “Structuralism” is many things to many contexts. I use it in a specifically mathematical way, to denote that the state space of qualia quite likely embodies many mathematical structures, or properties (such as being a metric space). Mike: We know very little about consciousness. This is a problem, for various and increasing reasons– it’s upstream of a lot of futurist-related topics. But nobody seems to know quite where to start unraveling this mystery. The way we talk about consciousness is stuck in “alchemy mode”– we catch glimpses of interesting patterns, but it’s unclear how to systematize this into a unified framework. How to turn ‘consciousness alchemy’ into ‘consciousness chemistry’, so to speak. Qualia Research Institute is a research collective which is working on building a new “science of qualia”. Basically, we think our “full-stack” approach cuts through all the confusion around this topic and can generate hypotheses which are novel, falsifiable, and useful. Also see the 2nd part, and the 3rd part of this interview series. Also this interview with Christof Koch will likely be of interest. Mike Johnson is a philosopher living in the Bay Area, writing about mind, complexity theory, and formalization. He is Co-founder of the Qualia Research Institute. Much of Mike’s research and writings can be found at the Open Theory website. ‘Principia Qualia’ is Mike’s magnum opus – a blueprint for building a new Science of Qualia. Click here for the full version, or here for an executive summary. If you like Mike’s work, consider helping fund it at Patreon. Andrés Gómez Emilsson joined in to add very insightful questions for a 3 part interview series with Mike Johnson, covering the relationship of metaphysics to qualia/consciousness/hedonic valence, and defining their terms, whether panpsychism matters, increasing sensitivity to bliss, valence variance, Effective Altruism, cause prioritization, and the importance of consciousness/valence research . Andrés L. Gómez Emilsson: Do metaphysics matter for understanding qualia, consciousness, valence and intelligence? Mike Johnson: If we define metaphysics as the study of what exists, it absolutely does matter for understanding qualia, consciousness, and valence. I think metaphysics matters for intelligence, too, but in a different way. The big question is whether terms like qualia, consciousness, and valence “carve reality at the joints” or whether they’re emergent linguistic constructs that don’t reflect the structure of the universe. And if these things are ‘real’ in some sense, the follow-up question is: how can we formalize these concepts? Intelligence seems different: it seems like a ‘fuzzy’ concept, without a good “crisp”, or frame-invariant, definition. Andrés: What about sources of sentient valence outside of human brains? What is the “minimum viable valence organism”? What would you expect it to look like? Mike: If some form of panpsychism is true- and it’s hard to construct a coherent theory of consciousness without allowing panpsychism- then I suspect two interesting things are true. A lot of things are probably at least a little bit conscious. The “minimum viable valence experiencer” could be pretty minimal. Both Brian Tomasik and Stuart Hameroff suggest that there could be morally-relevant experience happening at the level of fundamental physics. This seems highly counter-intuitive but also logically plausible to me. Biological organisms probably don’t constitute the lion’s share of moral experience. If there’s any morally-relevant experience that happens on small levels (e.g., quantum fuzz) or large levels (e.g., black holes, or eternal inflation), it probably outweighs what happens on Earth by many, many, many orders of magnitude. Whether it’ll outweigh the future impact of humanity on our light-cone is an open question. The big question is whether terms like qualia, consciousness, and valence “carve reality at the joints” or whether they’re emergent linguistic constructs that don’t reflect the structure of the universe. And if these things are ‘real’ in some sense, the follow-up question is: how can we formalize these concepts? In contrast with Brian Tomasik on this issue, I suspect (and hope) that the lion’s share of the qualia of the universe is strongly net positive. Appendix F of Principia Qualia talks a little more about this. Andrés: What would be the implications of finding a sure-fire way to induce great valence for brief moments? Could this be used to achieve “strategic alignment” across different branches of utilitarianism? Mike: A device that could temporarily cause extreme positive or negative valence on demand would immediately change the world. First, it would validate valence realism in a very visceral way. I’d say it would be the strongest philosophical argument ever made. Second, it would obviously have huge economic & ethical uses. Third, I agree that being able to induce strong positive & negative valence on demand could help align different schools of utilitarianism. Nothing would focus philosophical arguments about the discount rate between pleasure & suffering more than a (consensual!) quick blast of pure suffering followed by a quick blast of pure pleasure. Similarly, a lot of people live their lives in a rather numb state. Giving them a visceral sense that ‘life can be more than this’ could give them ‘skin in the game’. Fourth, it could mess a lot of things up. Obviously, being able to cause extreme suffering could be abused, but being able to cause extreme pleasure on-demand could lead to bad outcomes too. You (Andres) have written about wireheading before, and I agree with the game-theoretic concerns involved. I would also say that being able to cause extreme pleasure in others could be used in adversarial ways. More generally, human culture is valuable and fragile; things that could substantially disrupt it should be approached carefully. A friend of mine was describing how in the 70s, the emerging field of genetic engineering held the Asilomar Conference on Recombinant DNA to discuss how the field should self-regulate. The next year, these guidelines were adopted by the NIH wholesale as the basis for binding regulation, and other fields (such as AI safety!) have attempted to follow the same model. So the culture around technologies may reflect a strong “founder effect”, and we should be on the lookout for a good, forward-looking set of principles for how valence technology should work. One principle that seems to make sense is to not publicly post ‘actionable’ equations, pseudocode, or code for how one could generate suffering with current computing resources (if this is indeed possible). Another principle is to focus resources on positive, eusocial applications only, insofar as that’s possible– I’m especially concerned about addiction, and bad actors ‘weaponizing’ this sort of research. Another would be to be on guard against entryism, or people who want to co-opt valence research for political ends. All of this is pretty straightforward, but it would be good to work it out a bit more formally, look at the successes and failures of other research communities, and so on. A question I find very interesting is whether valence research is socially disruptive or socially stabilizing by default. I think we should try very hard to make it a socially stabilizing force. Andrés: What should we prioritize: super-intelligence, super-longevity or super-happiness? Does the order matter? Why? Mike: I think it matters quite a bit! For instance, I think the world looks a lot different if we figure out consciousness *before* AGI, versus if we ignore it until AGI is built. The latter seems to involve various risks that the former doesn’t. A risk that I think we both agree is serious and real is this notion of “what if accelerating technology leads to Malthusian conditions where agents don’t- and literally can’t, from a competitive standpoint- care about qualia & valence?” Robin Hanson has a great post called “This is the Dream Time” (of relaxed selection). But his book “Age of Em” posits a world where selection pressures go back up very dramatically. I think if we enter such an era without a good theory of qualia, we could trade away a lot of what makes life worth living. Andrés: What are some conceptual or factual errors that you see happening in the transhumanist/rationalist/EA community related to modeling qualia, valence and intelligence? Mike: First, I think it’s only fair to mention what these communities do right. I’m much more likely to have a great conversation about these topics with EAs, transhumanists, and rationalists than a random person off the street, or even a random grad student. People from this community are always smart, usually curious, often willing to explore fresh ideas and stretch their brain a bit, and sometimes able to update based on purely abstract arguments. And there’s this collective sense that ideas are important and have real implications for the future. So there’s a lot of great things happening in these communities and they’re really a priceless resource for sounding out theories, debating issues, and so on. But I would highlight some ways in which I think these communities go astray. Computationalism, functionalism, fun theory, ‘hedonic brain regions’, ‘pleasure neurochemicals’, the reinforcement learning theory of valence, and so on all give the illusion of explanatory depth but don’t actually explain things in a way which allows us to do anything useful. Also see the 1st part, and the 2nd part of this interview series. Also this interview with Christof Koch will likely be of interest. Mike Johnson is a philosopher living in the Bay Area, writing about mind, complexity theory, and formalization. He is Co-founder of the Qualia Research Institute. Much of Mike’s research and writings can be found at the Open Theory website. ‘Principia Qualia’ is Mike’s magnum opus – a blueprint for building a new Science of Qualia. Click here for the full version, or here for an executive summary. If you like Mike’s work, consider helping fund it at Patreon. What’s the relationship between valence research and AI ethics? Hedonic valence is a measure of the quality of our felt sense of experience, the intrinsic goodness (positive valence) or averseness (negative valence) of an event, object, or situation. It is an important aspect of conscious experience; always present in our waking lives. If we seek to understand ourselves, it makes sense to seek to understand how valence works – how to measure it and test for it. Also, might there be a relationship to the AI safety/friendliness problem? In this interview, we cover a lot of things, not least .. THE SINGULARITY (of course) & the importance of Valence Research to AI Friendliness Research (as detailed here). Will thinking machines require experience with valence to understand it’s importance? Here we cover some general questions about Mike Johnson’s views on recent advances in science and technology & what he sees as being the most impactful, what world views are ready to be retired, his views on XRisk and on AI Safety – especially related to value theory. This one part of an interview series with Mike Johnson (another section on Consciousness, Qualia, Valence & Intelligence). Adam Ford: Welcome Mike Johnson, many thanks for doing this interview. Can we start with your background? Mike Johnson: My formal background is in epistemology and philosophy of science: what do we know & how do we know it, what separates good theories from bad ones, and so on. Prior to researching qualia, I did work in information security, algorithmic trading, and human augmentation research. Adam: What is the most exciting / interesting recent (scientific/engineering) news? Why is it important to you? Mike: CRISPR is definitely up there! In a few short years precision genetic engineering has gone from a pipe dream to reality. The problem is that we’re like the proverbial dog that caught up to the car it was chasing: what do we do now? Increasingly, we can change our genome, but we have no idea how we should change our genome, and the public discussion about this seems very muddled. The same could be said about breakthroughs in AI. Adam: What are the most important discoveries/inventions over the last 500 years? Mike: Tough question. Darwin’s theory of Natural Selection, Newton’s theory of gravity, Faraday & Maxwell’s theory of electricity, and the many discoveries of modern physics would all make the cut. Perhaps also the germ theory of disease. In general what makes discoveries & inventions important is when they lead to a productive new way of looking at the world. Mike: I think that 99% of the time when someone uses the term “pleasure neurochemicals” or “hedonic brain regions” it obscures more than it explains. We know that opioids & activity in the nucleus accumbens are correlated with pleasure– but we don’t know why, we don’t know the causal mechanism. So it can be useful shorthand to call these things “pleasure neurochemicals” and whatnot, but every single time anyone does that, there should be a footnote that we fundamentally don’t know the causal story here, and this abstraction may ‘leak’ in unexpected ways. Adam: What have you changed your mind about? Mike: Whether pushing toward the Singularity is unequivocally a good idea. I read Kurzweil’s The Singularity is Near back in 2005 and loved it- it made me realize that all my life I’d been a transhumanist and didn’t know it. But twelve years later, I’m a lot less optimistic about Kurzweil’s rosy vision. Value is fragile, and there are a lot more ways that things could go wrong, than ways things could go well. Adam: I remember reading Eliezer’s writings on ‘The Fragility of Value’, it’s quite interesting and worth consideration – the idea that if we don’t get AI’s value system exactly right, then it would be like pulling a random mind out of mindspace – most likely inimicable to human interests. The writing did seem quite abstract, and it would be nice to see a formal model or something concrete to show this would be the case. I’d really like to know how and why value is as fragile as Eliezer seems to make out. Is there any convincing crisply defined model supporting this thesis? If this frame is right, then it’s going to be really really really hard to get AGI right, because one wrong step in programming will make the AGI depart from human values, and “there will be nothing left to want to bring it back.” Eliezer, and I think most of the AI safety community assumes this. But– and I want to shout this from the rooftops– the complexity of value thesis is just a thesis! Nobody knows if it’s true. An alternative here would be, instead of trying to look at value in terms of goals and preferences, we look at it in terms of properties of phenomenological experience. This leads to what I call the Unity of Value Thesis, where all the different manifestations of valuable things end up as special cases of a more general, unifying principle (emotional valence). What we know from neuroscience seems to support this: Berridge and Kringelbach write about how “The available evidence suggests that brain mechanisms involved in fundamental pleasures (food and sexual pleasures) overlap with those for higher-order pleasures (for example, monetary, artistic, musical, altruistic, and transcendent pleasures).” My colleague Andres Gomez Emilsson writes about this in The Tyranny of the Intentional Object. Anyway, if this is right, then the AI safety community could approach the Value Problem and Value Loading Problem much differently. Adam: I’m also interested in the nature of possible attractors that agents might ‘extropically’ gravitate towards (like a thirst for useful and interesting novelty, generative and non-regressive, that might not neatly fit categorically under ‘happiness’) – I’m not wholly convinced that they exist, but if one leans away from moral relativism, it makes sense that a superintelligence may be able to discover or extrapolate facts from all physical systems in the universe, not just humans, to determine valuable futures and avoid malignant failure modes (Coherent Extrapolated Value if you will). Being strongly locked into optimizing human values may be a non-malignant failure mode. Mike: What you write reminds me of Schmidhuber’s notion of a ‘compression drive’: we’re drawn to interesting things because getting exposed to them helps build our ‘compression library’ and lets us predict the world better. But this feels like an instrumental goal, sort of a “Basic AI Drives” sort of thing. Would definitely agree that there’s a danger of getting locked into a good-yet-not-great local optima if we hard optimize on current human values. If we lock in human values based on common sense, we’re basically committing to following an inconsistent formal system. I don’t think most people realize how badly that will fail. Adam: What invention or idea will change everything? Mike: A device that allows people to explore the space of all possible qualia in a systematic way. Right now, we do a lot of weird things to experience interesting qualia: we drink fermented liquids, smoke various plant extracts, strap ourselves into rollercoasters, and parachute out of plans, and so on, to give just a few examples. But these are very haphazard ways to experience new qualia! When we’re able to ‘domesticate’ and ‘technologize’ qualia, like we’ve done with electricity, we’ll be living in a new (and, I think, incredibly exciting) world. Adam: What are you most concerned about? What ought we be worrying about? Mike: I’m worried that society’s ability to coordinate on hard things seems to be breaking down, and about AI safety. Similarly, I’m also worried about what Eliezer Yudkowsky calls ‘Moore’s Law of Mad Science’, that steady technological progress means that ‘every eighteen months the minimum IQ necessary to destroy the world drops by one point’. But I think some very smart people are worrying about these things, and are trying to address them. In contrast, almost no one is worrying that we don’t have good theories of qualia & valence. And I think we really, really ought to, because they’re upstream of a lot of important things, and right now they’re “unknown unknowns”- we don’t know what we don’t know about them. Now, if we don’t know how qualia works, I think this is the default case. Our future could easily be a technological wonderland, but with very little subjective experience. “A Disneyland with no children,” as Bostrom quips. Adam: How would you describe your ethical views? What are your thoughts on the relative importance of happiness vs. suffering? Do things besides valence have intrinsic moral importance? Mike: Good question. First, I’d just like to comment that Principia Qualia is a descriptive document; it doesn’t make any normative claims. I think the core question in ethics is whether there are elegant ethical principles to be discovered, or not. Whether we can find some sort of simple description or efficient compression scheme for ethics, or if ethics is irreducibly complex & inconsistent. Strictly speaking, conscious experience is necessary for intrinsic moral significance. I.e., I care about what happens to dogs, because I think they’re conscious; I don’t care about what happens to paperclips, because I don’t think they are. Some conscious experiences do feel better than others, and all else being equal, pleasant experiences have more value than unpleasant experiences. Beyond this, though, I think things get very speculative. Is valence the only thing that has intrinsic moral importance? I don’t know. On one hand, this sounds like a bad moral theory, one which is low-status, has lots of failure-modes, and doesn’t match all our intuitions. On the other hand, all other systematic approaches seem even worse. And if we can explain the value of most things in terms of valence, then Occam’s Razor suggests that we should put extra effort into explaining everything in those terms, since it’d be a lot more elegant. So– I don’t know that valence is the arbiter of all value, and I think we should be actively looking for other options, but I am open to it. That said I strongly believe that we should avoid premature optimization, and we should prioritize figuring out the details of consciousness & valence (i.e. we should prioritize research over advocacy). Re: the relative importance of happiness vs suffering, it’s hard to say much at this point, but I’d expect that if we can move valence research to a more formal basis, there will be an implicit answer to this embedded in the mathematics. Perhaps the clearest and most important ethical view I have is that ethics must ultimately “compile” to physics. What we value and what we disvalue must ultimately cash out in terms of particle arrangements & dynamics, because these are the only things we can actually change. And so if people are doing ethics without caring about making their theories cash out in physical terms, they’re not actually doing ethics- they’re doing art, or social signaling, or something which can serve as the inspiration for a future ethics. Perhaps the clearest and most important ethical view I have is that ethics must ultimately “compile” to physics. What we value and what we disvalue must ultimately cash out in terms of particle arrangements & dynamics, because these are the only things we can actually change. The analogy I’d offer here is that we can think about our universe as a computer, and ethics as choosing a program to run on this computer. Unfortunately, most ethicists aren’t writing machine-code, or even thinking about things in ways that could be easily translated to machine-code. Instead, they’re writing poetry about the sorts of programs that might be nice to run. But you can’t compile poetry to machine-code! So I hope the field of ethics becomes more physics-savvy and quantitative (although I’m not optimistic this will happen quickly). Eliezer Yudkowsky refers to something similar with his notions of “AI grade philosophy”, “compilable philosophy”, and “computable ethics”, though I don’t think he quite goes far enough (i.e., all the way to physics). Adam: What excites you? What do you think we have reason to be optimistic about? Mike: The potential of qualia research to actually make peoples’ lives better in concrete, meaningful ways. Medicine’s approach to pain management and treatment of affective disorders are stuck in the dark ages because we don’t know what pain is. We don’t know why some mental states hurt. If we can figure that out, we can almost immediately help a lot of people, and probably unlock a surprising amount of human potential as well. What does the world look like with sane, scientific, effective treatments for pain & depression & akrasia? I think it’ll look amazing. Adam: If you were to take a stab at forecasting the Intelligence Explosion – in what timeframe do you think it might happen (confidence intervals allowed)? Mike: I don’t see any intractable technical hurdles to an Intelligence Explosion: the general attitude in AI circles seems to be that progress is actually happening a lot more quickly than expected, and that getting to human-level AGI is less a matter of finding some fundamental breakthrough, and more a matter of refining and connecting all the stuff we already know how to do. If it doesn’t happen by 2100, it probably implies a fundamental shift in our ability or desire to create an Intelligence Explosion, and so it might take hundreds of years (or never happen). Also see the 2nd part, and 3nd part (conducted by Andrés Gómez Emilson) of this interview series conducted by Andrés Gómez Emilson and this interview with Christof Koch will likely be of interest. An online panel focusing on reducing suffering & paradise engineering through the lens of science. Note, consider skipping to to 10:19 to bypass some audio problems in the beginning!! How do we know consciousness is causally efficacious? Because we are conscious and evolution can only recruit systems/properties when they do something (and they do it better than the available alternatives). What is consciousness’ purpose on animals? (Information processing). What is consciousness’ comparative advantage? (Phenomenal binding). Why does this matter for suffering reduction? Suffering has functional properties that play a role in the inclusive fitness of organisms. If we figure out exactly what role they play (by reverse-engineering the computational properties of consciousness), we can substitute them by equally (or better) functioning non-conscious or positive hedonic-tone analogues. What is the focus of Qualia Computing? (it focuses on basic fundamental questions and simple experimental paradigms to get at them (e.g. computational properties of visual qualia via psychedelic psychophysics)). If we successfully “reverse-engineer” the patterns for pain and pleasure, what does ‘responsible disclosure’ look like? Potential benefits and potential for abuse both seem significant. If we agree that valence is a pattern in a dataset, what’s a good approach to defining the dataset, and what’s a good heuristic for finding the pattern? What are your expectations of the distribution of suffering in the world? What proportion happens in nature vs within the boundaries of civilization? What are counter-intuitive sources of suffering? Do we know about ~90% of suffering on the earth, or ~.001%? Valence Research, The Mystery of Pain & Pleasure. How do we use the available science to improve the QALY? GiveDirectly has used change in cortisol levels to measure effectiveness, and the EU (what’s EU stand for?) evidently does something similar involving cattle. It seems like a lot of the pieces for a more biologically-grounded QALY- and maybe a SQALY (Species and Quality-Adjusted Life-Year)- are available, someone just needs to put them together. I suspect this one of the lowest-hanging highest-leverage research fruits. David Pearce: The ultimate scope of our moral responsibilities. Assume for a moment that our main or overriding goal should be to minimise and ideally abolish involuntary suffering. I typically assume that (a) only biological minds suffer and (b) we are probably alone within our cosmological horizon. If so, then our responsibility is “only” to phase out the biology of involuntary suffering here on Earth and make sure it doesn’t spread or propagate outside our solar system. But Brian, for instance, has quite a different metaphysics of mind, most famously that digital characters in video games can suffer (now only a little – but in future perhaps a lot). The ramifications here for abolitionist bioethics are far-reaching. – Effective Altruism/Cause prioritization and suffering reduction – People’s practical recommendations for the best projects that suffering reducers can work on (including where to donate, what research topics to prioritize, what messages to spread). – So cause prioritization applied directly to the abolition of suffering? – If we agree that valence is a pattern in a dataset, what’s a good approach to defining the dataset, and what’s a good heuristic for finding the pattern? 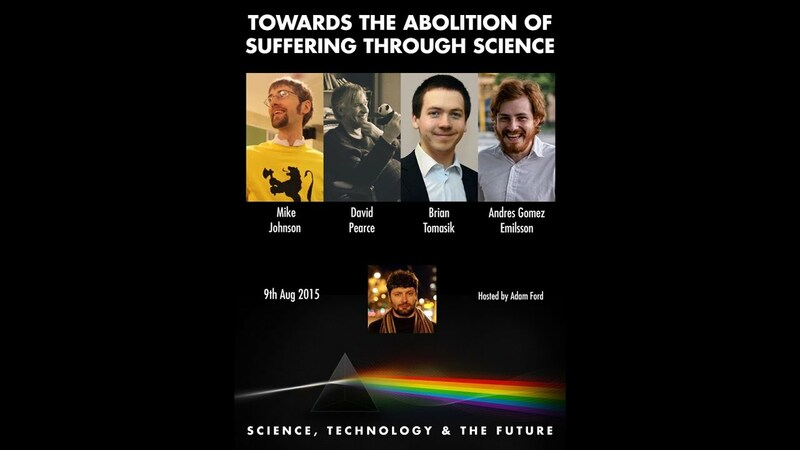 Towards the Abolition of Suffering Through Science was hosted by Adam Ford for Science, Technology and the Future. Until computer scientists can solve the far more difficult problem of commonsense intelligence, machines will remain our intellectual inferiors and subject to our dominion.